What a beautiful day Katherine & Evan had to exchange their wedding vows at Keswick Vineyards on Saturday, May 30th. Katherine looked absolutely stunning in her wedding dress! Evan didn't look so bad either:) Both being UVA graduates, they chose to have orange and blue as their accent colors. I love how their corn hole boards were decorated with the UVA emblem and they also hung banners under the tent. 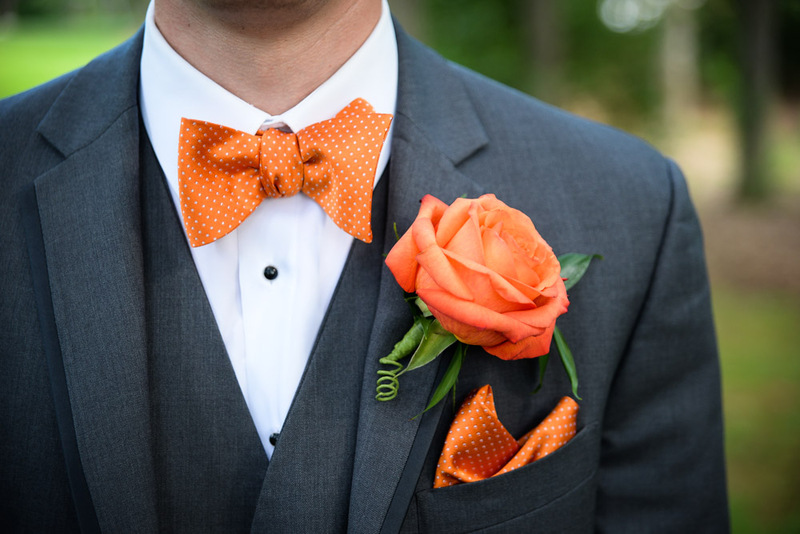 The guys wore charcoal grey suits with orange boutonnieres. Special thanks to the following vendors for providing such a wonderful experience for our couple: Caterer Harvest Moon, Photographer Tyler Corvin & Rebecca, Dessert provided by Cakes by Rachael, DJ TD Layman of Sound Enforcement, Musicians for ceremony provided by Linden Trio, Hair & Make-up by Moxie Hair Salon & Lounge, Flowers by Natalie, Transportation by Easy Riders, Photo Booth provided by Photo Booth of Charlottesville, Albemarle Limousine for vintage get away car and Officiant Virginia Moore.